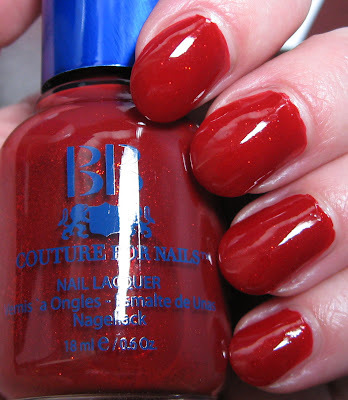 Above & Below: BB Couture's Cherry Baby is a Cherry red with subtle shimmer. The color never loses it's clarity and stays a true red in all lighting. Below: If you asked me to match this color to an item, I'd have to go with a Marischino Cherry. It was the first thing that came to mind after I placed the initial brushstroke. 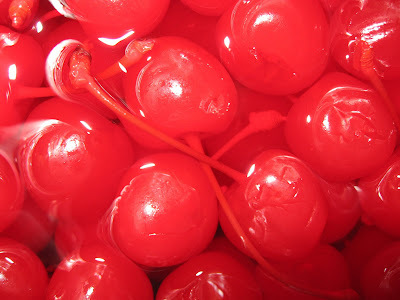 Below: One of my favorite snacks when I'm trying to curb a sweet tooth is frozen Maraschino cherries. I place them in a Tupperware container in the freezer with about 1/2" of the juice. The juice never freezes entirely, and the cherries taste so sweet. They don't have much nutrional value, but they're only 10 calories each. I'm clearing my untried BB Coutures making way for their new Spring 2010 Ladybug Collection! First up is Cherry Baby, a perfect Cherry red creme accented with red foil micro glitter. The glitter is subtle, yet noticeable, and the finish has a very high gloss. I used 2 coats and I had no application issues. I have a number of reds that tend to turn toward the pink side in various lighting, but this one stays true. The only thing I don't like about it? Now I have Frankie Valli's Sherry Baby stuck in my head! That is a very gorgeous red color! Red colors like that defines a woman as having a lot of confidence within herself & defines herself as more pretty & beautiful. Holy crap thats pretty *__* and it really does match the cherries. I love this shade! I actually have used this polish. When I bought the collection I tried this one first. It was so bright and red! I love, love, yes, love this red. It's stunning and bright. Looks fantastic on you. That's a terrific idea to freezed the cherries! I also love them. They never lasted in the house when I was little. My Mom would buy them for baking. She'd cut them up small to put on the butter cookies for Christmas. After that my brother and I would eat them one by one. I also used to pour out some of the juice into a glass of milk. It was delicious. The bad thiang was I'd fill up the jar with water and shake it up good. The cherries still tasted good but the juice wasn't that strong. No one knew what I did to the juice in the jar. I can't wait to try the frozen cherries. I think I have a half of a jar! All~glad you all like this one! It is one of my newest favorite reds! Lucy, you'll love the frozen cherries, especially if you love them already! Oh those cherries, I wish I could get them here but so far, no luck. We have cherries for baking, but they're dry and awful to eat. When I spent a youth year in the US (1981-82) I was thought to take a cherry in my mouth, eat the cherry and make a knot on the stem at the same time. Very useful knowledge, right ;-p ?